Labor Day 2017 finds most workers no better off than they were a decade ago. Wages are largely stagnant—there have been signs of a slight upturn here—union membership is down; the stock market is soaring, though the rich are its greatest beneficiaries; rights seem to expand for corporations and contract for individuals; and President Trump is hell bent on eliminating regulations protecting workers and the environment. If this administration is able to effect any “tax reform,” it is likely that the rich will be its major beneficiaries. Labor Day 2017 seems a good day to turn to art for inspiration for producing a better, more just and more democratic America. One of my favorite movie scenes is from the 1979 film Norma Rae. 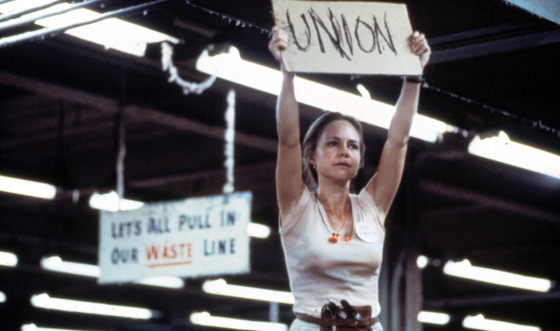 Sally Field plays a textile worker turned union organizer who, while waiting to be taken away by the police from her cotton mill workplace, stands on a table showing a hand-lettered sign proclaiming “UNION” to her fellow workers. In response, the machines in the mill fall silent one-by-one. It is a very emotional moment in American cinema. Norma Rae Webster was modeled on the work of union organizer Crystal Lee Sutton at the J.P. Stevens plant in Roanoke Rapids, North Carolina. The still below is from that famous scene in Norma Rae. Sally Field won an Academy Award for her role in the film. In the struggle between labor and management, one advantage of labor is that it has had better songs. One of the most famous is “Which Side Are You On?” The lyrics were written in 1931 by Florence Patton Reece, wife of a union organizer in Harlan County, Kentucky, which saw an epic, sometimes violent, struggle between coal mine workers and coal mine operators. Or a thug for J.H. Blair. J.H. Blair, by the way, was not a coal company, but the sheriff, who, with his men, were hired to intimidate the minors in the bitter labor dispute. Many singers have popularized this song, though not all have been true to the original. The version below changes none of the words of the song, though it does omit the repeat in the chorus. This Labor Day, we should be asking why there is an increasing wealth gap between the very rich and everyone else. The diminished influence of labor unions is certainly one factor. Other factors include the power of corporate lobbyists and the greater voice given big business by the Citizens United decision. One of the most significant changes that has affected the welfare of workers is the notion that the corporation has no obligations save to its shareholders. This idea has been absolutely toxic to the body politic. Making everything worse, of course, is an administration that never met a federal regulation it liked. What can we do to restore prosperity to all of our citizens? Which side are you on? Impressions of Donald Trump’s Speech to the U.N.